It’s been a great year for ice climbing in Sandstone, Minnesota. Even with the warm November temps by mid-December the ice was fat for climbing. The Minnesota Climbers Association and volunteer climbers “farmed” the ice in Robinson Park providing a destination for ice climbers. Traveling from as far away as California, Florida, and even Texas – adventure lovers are making Robinson Park in Sandstone, Minnesota the place to go for easy access ice climbing. 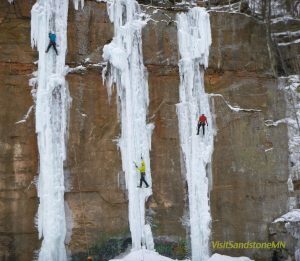 The Sandstone Ice Park has its busiest climbing season ever, the word is starting to get out that the ice in Sandstone, Minnesota is the place to go for reliable, climbable, and easy accessible steep ice. Robinson Park has come a long way since the first Sandstone Ice Festival back 2004 when a single gas pump was used to bring water up to the top of the cliff face. Since then the Minnesota Climbers Association has worked with the city of Sandstone to install plumbing to make flooding the walls easier. 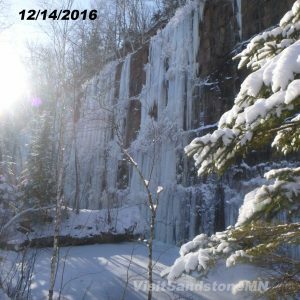 and now, as of 2017 it is possible to rent ice climbing gear in Sandstone, Minnesota.